The defeat at Crewe Alexandra was the final straw for Darren Ferguson – something had to be done. 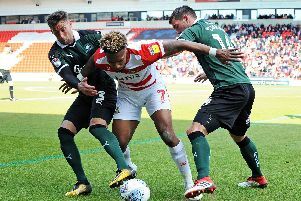 Doncaster Rovers may have made a strong start to life in League Two but the club’s manager would not take any chances when it came to losing games. So he did the only thing a self-confessed superstitious boss could think to do – he banned his dad. Ferguson’s father is, of course, no run-of-the-mill parent when it comes to footballing circles. So how exactly do you ban Sir Alex Ferguson from coming to watch your games? “He’s bad luck – in fact he’s a nightmare,” Ferguson junior said with a pained smile. “After he came to the Crewe game in September and we both said the same thing – he’s not coming any more. “He was at York in pre-season when Luke McCullough did his cruciate, he came to the Crawley game we drew. “He came last year quite a few times, but then again so did a lot of people so I’m not sure I can blame that on him. “It’s amazing how it works. Even when I was at Peterborough he wasn’t good luck. “When we won at Wembley, that was about the only time he saw me win. “I banned him from the play-off final at Old Trafford in 2011. “It’s not just him though, I don’t think my wife and kids have seen Donny win yet. “They were at the Crawley game as well and I said to my wife I didn’t think she could come back again. “But you get paranoid. I’m quite a superstitious guy and I was a nightmare as a player. Though the positive effects of his superstitions may have evaded him last season, whatever Ferguson is doing now – including issuing stay-away orders to family members – is working. Last weekend he passed his one-year anniversary as Rovers boss with the team second in League Two and matching the two-points-per-game target he set as a guideline for promotion winners. Management has been a long and winding road for Ferguson. In January he will reach the ten-year milestone as a manager, hunting a fourth career promotion. Stepping into any club’s most high-pressure role was something he admits wanting to do from a relatively early age in a playing career which took in Manchester United, Wolverhampton Wanderers, Sparta Rotterdam and Wrexham. “When I was about 28 at Wrexham, I started coaching the kids,” the former midfielder explained. “I did the U14s and U13s a couple of nights a week. I’d hang about after our training and do the written stuff then take the sessions in the evening. “At 29, Brian Flynn told me he was ready to move upstairs and wanted me to take the manager’s job but it was far too early for me. I had a playing career I wanted to finish. “I carried on coaching for three or four years and did all my badges by 35. That was one thing I made the right decision on, to get the badges done. “I just enjoyed coaching. I was captain at Wrexham and really enjoyed the responsibility of that so it made sense. Appointed as Peterborough manager at the age of 34, he guided a struggling side to a mid-table finish before winning promotion to League One in his first full season in charge. Promotion to the Championship followed the season after with Peterborough lauded as one of the most entertaining sides to watch. He continues to promote a high-tempo, attacking brand of football today with Rovers. “The one thing I wanted to make sure of when I became a manager that we had energy in the team,” he said. “That we play with a real tempo. “The first team I had at Peterborough had a lot of young players so there was no question they were going to do that. “Craig Mackail-Smith, George Boyd, Aaron McLean. They could run all over teams. “I’ve always tried to maintain that. “Sometimes you don’t get the type of player. When I went to Preston it was old and experienced players. “It was a difficult year for me there. They couldn’t really grasp what I was trying to do until it was too late. “I’ve always wanted to play with tempo. Winning the ball high up the pitch, you have more chance of scoring a goal. It’s as simple as that. After reaching the Championship with Peterborough in 2009, success slowed for Ferguson. He left London Road that November with Posh bottom of the table before spending a difficult 11 months in charge of a struggling Preston North End outfit. But he returned to Peterborough in January 2011 and immediately took them back into the Championship via the play-offs. Posh stayed up for two seasons before dropping back into League One despite accruing 54 points in their relegation season. He left the club again in February 2015 with Peterborough mid-table in League One. Rovers came calling in October last year and after a rollercoaster season in charge, they dropped into League Two, taking Ferguson back to where it all started. With his ten-year anniversary in management approaching, he admits he never expected to be back in English football’s bottom tier but is excited by the challenge of restoring Rovers to the Championship. When talking to Ferguson about his career and life, it is very difficult to avoid returning to the subject of his dad. On the day-to-day business of running Rovers, one makes a conscious effort to not ask questions about Sir Alex which could be tiresome. So how was it beginning a playing career at Manchester United, where a parent at the early stages of becoming king of Old Trafford? “I don’t think my old man really wanted to sign me at United,” he explains. “I’d been going to training as an apprentice and it was his coaches that said he really needed to sign me. “The week before I signed for United I was ready to sign for Nottingham Forest where Brian Clough was at the time. But I got called up for Scotland U16s on the day before I signed and I went to United. “I did my apprenticeship with United and got into the first team at 18. I played 15 games the first season they won the league so I got a winner’s medal. “It became a bit difficult between me and my old man. He was leaving me out when I didn’t think he should have. It became a bit strained and I just felt I needed to go. “At the time he wasn’t winning all the trophies, it was just the start of that and at times he was under a lot of pressure. “As his son, I was living with that all the time so I wasn’t knocking his door down. “It was totally the opposite when it came to nepotism. There wouldn’t be with him, as you’d expect. “The players knew he wasn’t a person who would favour his son and they knew he’d be the opposite. “There was that frustration for me but also I knew I wasn’t going to be playing every week. “United just went to a different level. They signed Paul Ince and Roy Keane. “I wasn’t one to sit there and not play. “It never became a long term problem between me and my old man, that we weren’t speaking or anything like that. “I got a good move to a Wolves side who were spending plenty of money trying to get into the Premier League. Having the wealth of knowledged and unrivalled experience of success to call upon is valuable, Ferguson admits. But he believes the main lessons in management learned from his father came when he was a player under Sir Alex. “You play under different managers and you take out the good and the bad,” said Ferguson, who cites Graham Taylor, Dennis Smith and Brian Flynn as other major influences. “A clear message from my old man was to be honest with your players. “They might not like you but they’ll respect you. “That’s why when I leave a player out, I tell him to his face. I just say they might not agree with me, I might be totally wrong but the reason is X. “I’ve had arguments with people in my office but there’s respect there. It was inevitable when Ferguson stepped into management himself that his family name would put him firmly in the spotlight. And he says it has been difficult living up to the Ferguson name. “It’s the right way of putting it because no one is ever going to repeat what he did,” he says. “It’s just not going to happen. “It is the name. Anything I’m ever mentioned in, it’s ‘Sir Alex Ferguson’s son.’ That’s just the way it is. “You learn to live with it. “But you want to do well for yourself, for your family. “As a manager I’ve had lots of ups and downs. It’s been like that. For this season at least, it is so far so good for Ferguson on that front. And the signs are that it will continue – just as long as his dad stays away.